The Yamal is a nuclear powered ice breaker planned and started under construction in Soviet Era Russia. She is the youngest of five Arktika class ships built from the mid 1970's. Her keel was laid in 1986 in St. Petersburg, by the time she was launched in October 1992 communism had collapsed in Russia. Like many other Russian icebreakers, the Yamal is now chartered out on other operations, particularly for tourists to earn much need foreign currency. The original purpose of being used to keep northern navigational routes open during the winter, is now less important. For their size, the Arktika class ships are amongst the most powerful and sophisticated ever built. The name "Yamal" means "End of the Earth" it is also applied to the Yamal Peninsula for the same reason. Built entirely for service in the Arctic seas, the Yamal is unable to voyage to the Antarctic because of her cooling system. This requires that it be supplied with cold sea water to operate properly, if the ship were to voyage to Antarctica it would have to cross the equator and sail through the tropics where the water is most definitely warm. Hence the Yamal and her sister ships are confined to the Northern polar region. 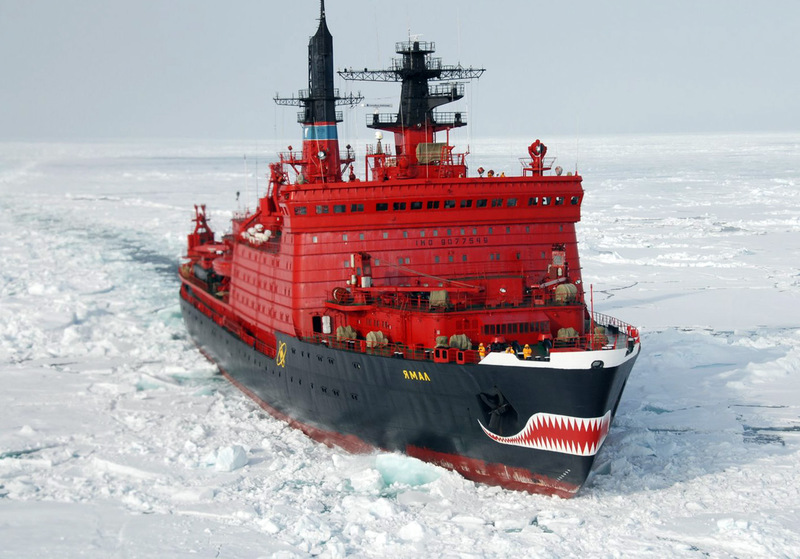 The Yamal is one of the few ice breakers that have sailed to the North Pole having done so for a millennial cruise arriving in time for the 1st of January 2000 with a compliment of paying passengers. Length: 150m (136m at the waterline), Breadth: 30m (28m at the waterline), Draft: 11.08m, Height: keel to mast head 55m. Power is supplied by two pressurized water nuclear reactors, each contains 245 enriched uranium fuel rods. Each reactor weighs 160 tonnes and are in a closed compartment under reduced pressure - in the event of a leak, the leak would be in and not out. 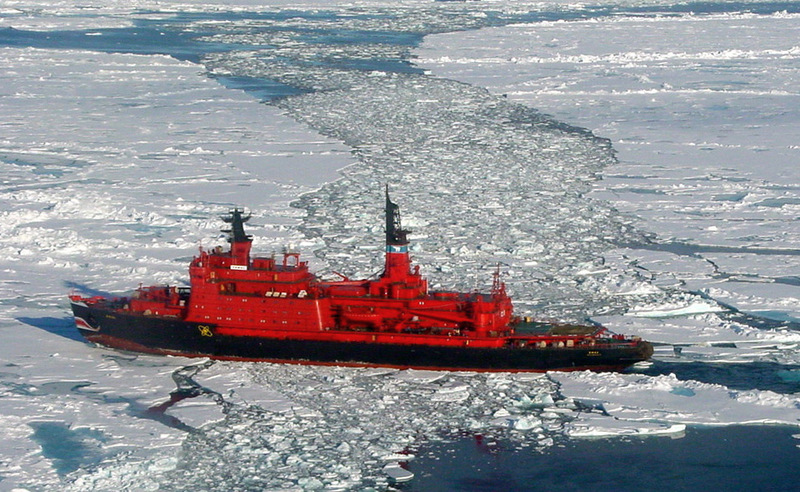 Maximum fuel use is 300g of heavy uranium isotopes per day when breaking thick ice. Reactors hold 500kg each when fully fuelled, enough for about 5 years. The reactors are shielded by steel, high density concrete and water. The nuclear chain reaction can be stopped in 0.6s by full insertion of the control rods. Radiation on the ship is monitored by 86 sensors throughout the vessel from within the reactor compartment to accommodation areas. The reactor cores are used to heat water up and produce pressurized steam at 30kgcm2. Each reactor has four boilers, each set of four boilers turn two steam turbines, which spin three dynamos each (confused yet?, that's 12 dynamos in total). The dynamos supply electric motors which are connected to the propeller shafts. Each motor can supply 25,000 shaft horse power to its screw of which there are three. So in all, the ship can develop 75,000 shaft horse power or 55.3MW - enough electricity to supply a town of 18,750 homes. Propellers are 5.7m diameter, fixed and weigh 50 tonnes each. Each has four 7 tonne blades, inspection wells allow them to be examined in operation, blades may be replaced at sea. Maximum speed: 22knots (40kmh), cruising speed 19.5 knots (35kmh) in calm open water. Ice 2.3m thick can be broken at 3 knots (5.5kmh). Maximum thickness of that can be penetrated is estimated at 5m, individual ridges of 9m have been broken. Steering can also be accomplished by directing the air jets of the bubbling system (comparable to use of bow-thrusters). Air bubbling system to help ice breaking. Jets 9 m below the surface can deliver 24m3s of air. Polymer coatings, specialized hull design, and the rapid movement of ballast water (pumps can move 1m3 (a tonne)of water per second) all these help in moving through and breaking ice. The cast steel prow is 48cm thick at its strongest point, that's about the same as the diagonal measurement of a 20" computer monitor. An helicopter is carried to help with navigation in ice and for tourist trips. The hull is double with water ballast between the two. The outer hull is 48mm thick armoured steel where ice is met and 25mm elsewhere. Picture credits: Top - Wofratz, published under Creative Commons 2.5 Share and Share Alike generic license | Bottom - www.basurama.org published under Creative Commons BY NC Share Alike 3.0 licence.